Bangladesh captain Mashrafe Mortaza and coach Jamie Siddons had contrasting views on the side's tour of England. The visitors secured a historic victory, against England in the Bristol ODI, but otherwise it was a forgettable trip, including embarrassing defeats against Associate nations Ireland and Netherlands. While Mortaza believed that his team had to take responsibility for the losses against the less-fancied teams, Siddons chose to instead savour the happiest moment of the tour. "There were some issues like losing the toss in both the matches [against Ireland and Netherlands] and the conditions but still I believe the players should take the responsibility for the defeats. 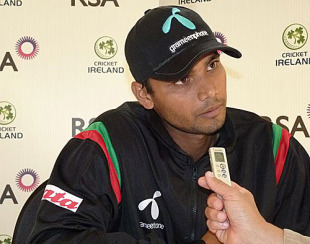 We didn't play well and that's why we lost the matches," Mortaza said on the team's arrival in Bangladesh. "I am very much aware of the fact that everybody shared the joy when we won the match [against England] but players are only responsible when we lose. "We should have won the series against Ireland against whom we secured a 3-0 victory at home. We will get some time before the World Cup and we must rectify the mistakes we made in the last series. I'm really concerned with our bowling. We should focus on this area ahead of the World Cup. I believe this team has got the quality to play much better cricket than the performance had against the two weak teams," he said. While Mortaza expressed concerns over the ineffectiveness of his bowling, Siddons gave the batsmen credit for performing in tough conditions. He believed the toss played a crucial role in deciding the outcome against Ireland and Netherlands. "You've got to listen to the whole story. The ground was under covers for five days and was under water four days earlier. Had we won the toss we would have had a chance. You weren't there; you don't understand what the wicket was like, what the conditions were like. "The pitch was damp, we missed two catches and bowling was poor so we lost the game [against Netherlands]. Don't be dramatic over that loss; it was a 30-overs game not a 50-overs game. Why don't you remember the win against England? It was a fantastic win," he said. Siddons also blamed hectic travel schedules and lack of adequate preparation time for the defeats. "You don't understand how much rushed we were to travel, we didn't get time to practise. There were real excuses. I think the team performed reasonably well and shouldn't have lost that game yesterday, but we did and we got to move on. We remember the win against Australia [in Cardiff] ten years later but we forgot the win against England two days later. That's not really fair."